It hits you when you most expect it. You’ve just finished your Goodfood dinner and that familiar craving for something sweet sets in. What’s a Goodfoodie to do? After countless requests from members to get dessert included their Goodfood boxes, we’re proud to draw the curtains on the newest addition to the Goodfood portfolio of deliciousness! 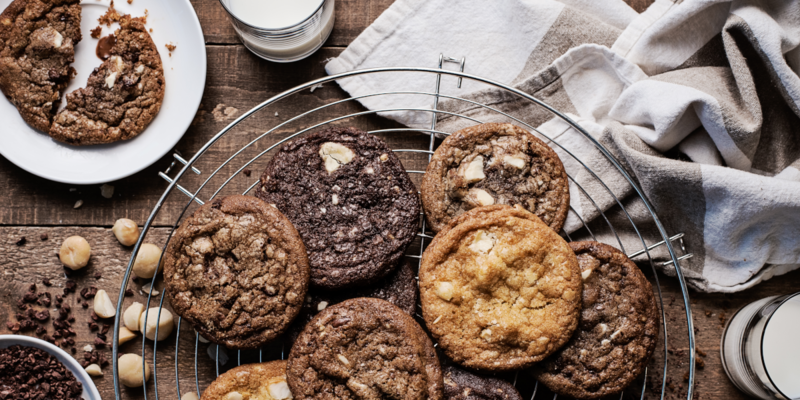 Sweet-tooths rejoice: you can now finish off your homemade meal with our new ready-to-bake cookies or pop some in the oven any time you need a freshly baked pick-me-up. Every package of 6 cookies (2 of each mouth-watering flavour) will make you the most popular person in your household in 8 minutes flat! Dark Chocolate Symphony, Sumptuous Trio, and Macadamia White Chocolate—there’s something for everyone in this sweet mix! This Valentine’s Day, go ahead and indulge a little (or a lot) with your loved ones! Check out what else is on the menu!